How low can you afford to go? Mindless signing of contracts without due regard to the viability of the offering, will hasten the premature death of the entity of the Family Practitioner (FP). We are frequently called by doctors who have had a "bad year", or new doctors entering the market, and requested to "make every contract available to them for signature." CPC / Qualicare is not legally in a position to refuse to comply with a valid request from our members, and thus, we will provide these contracts to you. Some funders are enlightened, and recognize the worth of the FP and in return offer enhanced fees for profiling and peer reviewed performance like AECI, Bonitas, Bankmed, Bestmed, (Medihelp Necesse)Polmed, Liberty and CDE's contracts for doctors who have completed the higher course in Diabetes through Qualicare. Some funders however offer you nothing except “that you are lucky to see our members”, and are big enough to bully you into submission. Others are decidedly awful and do not recognize the intrinsic worth of the FP, demand tasks and services which they know the average FP cannot afford to factor into their the offered contract price (which includes combining medication ,procedures and interventions). Even worse, some even delay your reimbursement until their cash flows are healthy. Some never pay before they go belly up and you end up carrying the can as they are not registered with the relevant regulatory authorities. Recently new players have entered the market looking like medical aids, but not under the control of the Council of Medical schemes. Their reimbursement models effectively reduce the nett worth of the FP to levels last seen many years ago, and their promise is “feet through the door" to your practice. Time will tell if they survive, however the common thread is that most of them do not have a network of doctors and are currently building GP networks, which doctors in their ignorance join not having looked carefully at the offerings to see if they are financially worthwhile. There is NOTHING to stop you from signing up except your common sense and our primeval sense of bankruptcy. 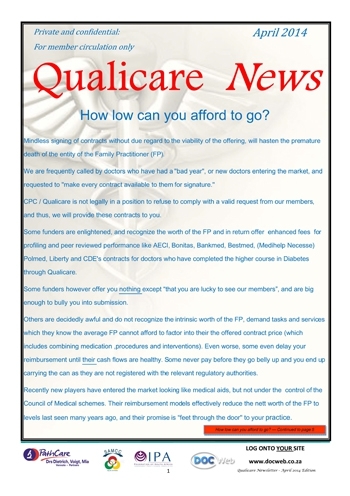 CPC/Qualicare is not in the business of price negotiation or price fixing. Nothing in our organization forces or compels you to service or not service a product based on price criteria. YOU are the final arbiter, and your practice will stand or fall depending on the intelligence of your decisions. 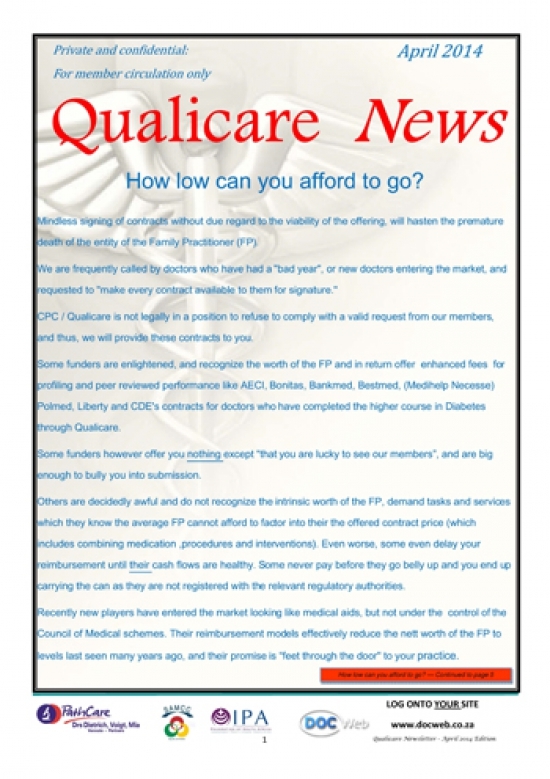 CPC/Qualicare has however decided to have nothing to do with these contracts as they do not offer any backup with which we can access the Organisations and enquire after your payments, challenge their peer review outcomes, oppose their decisions to pay the patient, etc etc. IN SHORT YOU ARE ON YOUR OWN. Do your sums. Write down your costs of running your practice, and know what it costs you for every hour that you are working. If these costs are high than you expected, don't try to compensate by signing every low cost contract which crosses your desk and which further increases your expenses by demanding that you include medication and procedures into your price. Discount your fee by all means, in an intelligent manner, but exercise caution, in the extreme, where it further increases your cost of sales. Finally, that YOU are the network and YOUR IPA is the network manager. The medical aids and their administrators have next to NO influence over your behaviour except for holding the purse strings and making payment hoops through which you need to jump for payment. Apart from that, they wield no influence over your practice. Their glossy newsletters and formularies are chucked into your practice waste bins before being opened, their websites go unutilised by 80% of FPs, and their practice nurse coordinators are treated as a waste of your time. They ONLY reason they require you to join their network IS TO CONTAIN PMB COSTS using strong arm tactics on FPs who do not come into line. Interestingly, their tactics with specialists is to offer them a HIGHER fee than their base rate for the same behaviour modification! Your IPA website, newsletter, mass emails and Connector, enjoys high monthly hits, and excellent penetration because you WANT to be there and be a part of your future.